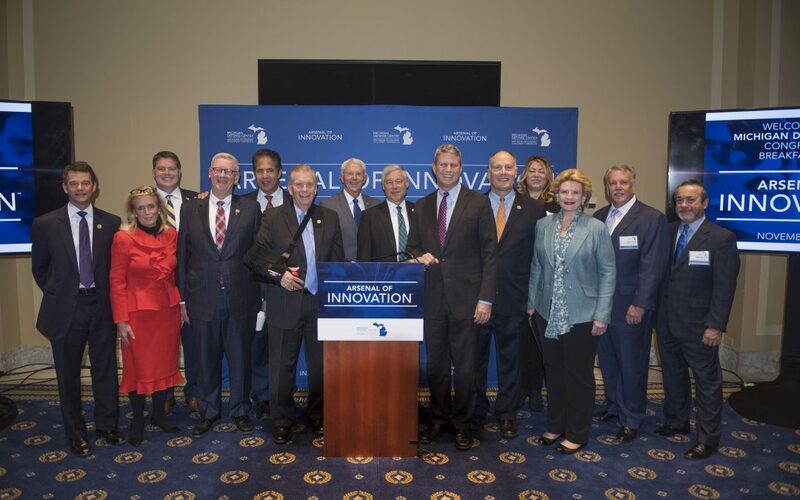 On November 1, 2017 the Michigan Defense Center hosted the Arsenal of Innovation™ event at the Rayburn House of Representatives Office Building in Washington DC. 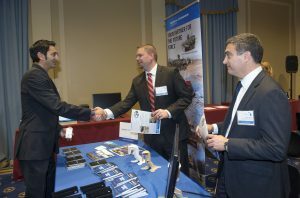 The Michigan Defense Center along with 14 high tech defense companies made the trip to Washington DC to display, demonstrate and discuss the match between Michigan’s R&D and technology companies and the growing needs for these innovations by the military. You will meet two of these cutting edge companies, RAVE Computer and DornerWorks in this newsletter. With 12 of the 14 Michigan Representatives and both Michigan U.S. Senators Stabenow and Peters, the Michigan Congressional Delegation continued to show their commitment to this industry. Speakers included General Dynamics Land Systems President Gary Whited, BAE Systems Sector Deputy and Vice President Business Development and Strategy Platforms & Services, Mark Signorelli. The momentum behind this event was the growing global recognition of a new and forward thinking way of manufacturing, Industry 4.0, the fourth industrial revolution. The first industrial revolution moved us from farming to production, mechanization, steam power, water power. The second industrial revolution moved us into Henry Ford and mass production and assembly lines. The third revolution moved us into computers and automation. The fourth revolution, which is upon us today, represents the convergence of digital and physical technologies. This is a new era of smart manufacturing. The Michigan Defense Center is working with our strategic partners at Automation Alley who are leading the way in assisting our companies with this transformation. Why is this important? Because today, Michigan is one of only 3 states in the nation that is in the top 5 in manufacturing and the top 5 in R&D. In order for us to maintain our R&D and manufacturing strengths we need to transform. This new era of digitization is driving quantum leaps in performance and Michigan’s plan is to assist our companies in this transformation because it is important to their success and our economy. Also of importance is that this transformation will drive efficiency that will naturally lead to a reduction in the price tag to our taxpayers. Most importantly this transformation is critical to our national security. Our military must always have the upper hand when it prepares to step on a battlefield, whether it be in the air, on land, or at sea. We must always have a superior position in equipping our Warfighters. No state understands that more than Michigan. This was our mission passed down from President Franklin D. Roosevelt in 1941, just before the U.S. entered WWII and every war and battle since that time. 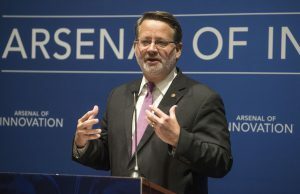 The defense industry and the Detroit Arsenal has been a key part of our Michigan economy, but more importantly it has been a driver of innovation that has tilted the battlefield in favor of the U.S. Warfighters. 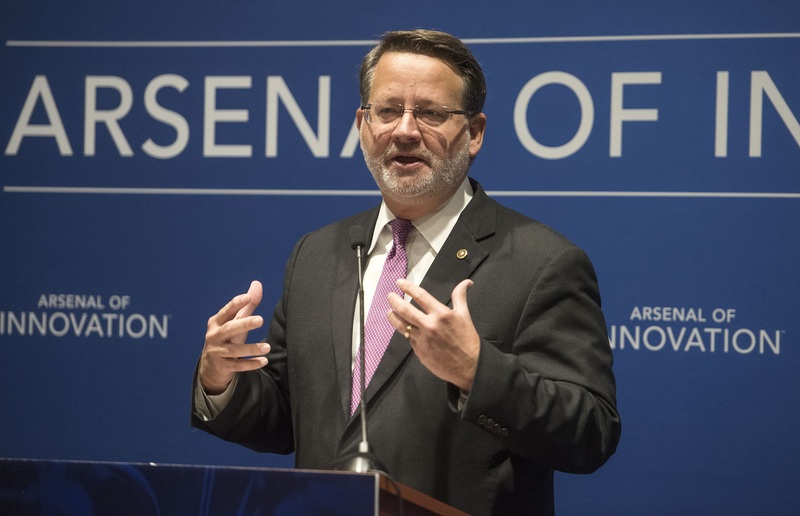 For the last 75 years, our Michigan companies have brought this innovation and technological superiority to the battle and that is why Michigan’s defense industry is called the Arsenal of Innovation™. 4D Systems, Flint, MI – One of the world’s leading providers of software, hardware and professional services for the engineering community, with an emphasis on the automotive, energy, defense, oil and gas, consumer goods and aerospace industries. Badenoch, LLC, Southfield, MI – The design and development of mass efficient survivable military vehicles; chassis, safety and communications systems employing embedded controls and advanced material applications; rigorous economic and technical modeling and simulation. BAE Systems, Sterling Heights, MI – An international defense, aerospace and security company which delivers a full range of products and services for air, land and naval forces, as well as advanced electronics, security, information technology solutions and customer support services. Calumet Electronics Corporation, Calumet, MI – High-velocity, high-performance printed circuit board (PCB) engineering and fabrication solutions in North America with a strong focus on aerospace, medical, defense and industrial sectors. Creative Composites, Inc., Rapid River, MI – Engineering and manufacturing structures utilizing composite systems. CyberNet, Ann Arbor, MI – Cybernet Systems is a woman-owned R&D company focused on creating and commercializing innovative, high quality, leading-edge solutions. DornerWorks, Grand Rapids, MI –Embedded Software Development Electronic Hardware Development FPGA / ASIC Custom Logic Engineering Requirements Definition Electronic System, Architecture Design Verification and Validation, Flight Certification Designs. General Dynamics Land Systems, Sterling Heights, MI – Global leader in the design, development, production, support and enhancement of tracked and wheeled military vehicles around the world. Global ET, Farmington Hills, MI – Power management engineering firm focusing on innovative products and solutions in the area of power control and power management electrical engineering. GS Engineering, Inc, Houghton, MI – Focused on design and analysis services, product development, instrumented field testing, and technology insertion. Specific areas of expertise include development and optimization of lightweight structures, correlation of analysis and simulation to test data, and systems integration for ground vehicles and aircraft. Infrared Telemetrics, Hancock, MI – Technology leader in providing wireless data transfer from reciprocating and rotating components. L’Anse Manufacturing & Technology, Inc., L’Anse, MI – Manufacturing transforms client concepts into initial prototypes, validation samples, or production parts. Creates a full service line of prototypes including cutting edge 3D models. Thermoanalytics, Inc, Calumet, MI – Engineering software services and products that specialize in heat management and infrared signature prediction.